In 2014 the University of Southampton and FutureLearn first ran a MOOC (Massive Open Online Course), focusing on the archaeological work in progress at the Roman site of Portus. The MOOC will run again in the early part of 2015. You can register now via the FutureLearn website. 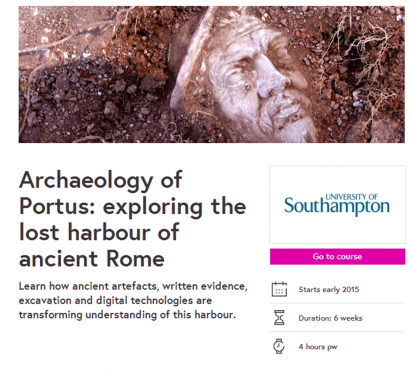 The Archaeology of Portus course is one of a number of Southampton-based courses that will be made available for people to study online, for free, wherever they are based in the world, in partnership with FutureLearn. We hope that this exciting opportunity appeals as a taster for people considering more formal educational programmes in this area, or to anyone with a particular interest in Roman history, archaeological methods, and the site of Portus. The response to the first running of the course was fabulous, with thousands of learners contributing for than 20,000 comments, filled with their ideas, questions and other contributions. The Portus online course builds on our previous work to share our fascination with the site and this period of history, via the BBC One Rome’s Lost Empire documentary and using exciting digital technologies. It also links online learners with the kinds of fieldwork activities and other Portus archaeological research that happens on site, providing those unable to attend the Portus Field School with an insight into archaeological research. You can also watch a video recorded on site in summer 2013 made by two University of Southampton Social Sciences undergraduates who worked at Portus as part of the Curriculum Innovation Portus Module, alongside archaeology students from Southampton, Rome and Stanford. They will act as some of the ‘student guides’ on the new online course. The Portus online course reflects the University’s commitment to multidisciplinary research at Portus, which bridges archaeology, electronics and computer science, ocean and earth science, geography, psychology, engineering, art and the humanities. It also builds upon the importance that the Portus Project has attached to active collaborative relationships with colleagues, universities and research institutions including the UK, France and Italy.